They’re mostly in rural areas, often in groups of dozens or more, almost always white, and often wildly flailing their arms – it’s amazing how much pro-Trump/anti-windpower rallies are similar to the wind farms. Recently, president Donald Trump sharply criticized wind power, shortly after demanding the repeal of gravity, and trying to win a staring contest against the sun. In Trump’s tremendously scientific opinion, the wind power is terrible because wind turbines decrease property values by 750% and the noise from the turbines causes cancer. But this is just scratching the surface on all the potential problems from the wind power, so here are 10 more reasons why America should stop using the wind power completely. 1) Wind turbines kill hundreds of birds who otherwise would be dying of natural causes like pollution and habitat destruction. 2) Wind turbines have been proven to cause nausea and headaches for coal executives. 3) Because wind occurs when hot air rises from the surface and is replaced by cooler air, eventually all the hot air on the planet will rise up and the planet will have no more hot air, and we therefore will run out of wind! Science! 4) Also, after all the hot air will get replaced by the cold air, we will see a global cooling instead of the global warming, and we will urgently need to burn coal to raise the Earth’s temperature back up. 5) Wind turbines generate lot of unhealthy noise, with 92% of that noise coming from the president and other Republicans. 6) When God is using strong winds like tornadoes and hurricanes to punish America for homosexuality, wind turbines pervert God’s plan, because wind turbines allow every homosexual to power up to 120 average American houses. 7) Also, if God wanted us to use wind power for electricity generation instead of coal, he would have left abundant underground deposits of wind turbines instead of coal. 8) Wind turbines are completely useless because they only work when the wind blows – which is the opposite of, say, Trump’s golf courses which only work when the weather is nice. 9) For all the windmill cancer they cause (there are currently zero documented cases, but the real number could be a thousand times that! ), wind turbines do not create nearly as much air pollution, toxic runoff, and other health problems as coal and oil, and wind power will therefore cause millions of doctors and nurses to lose their jobs. 10) Wind has no respect for the American laws and values and crosses the US border illegally every day from who knows how many Mexican countries. This entry was posted in List of 10 and tagged Donald Trump, humor, Political satire, Politics, satire, science, United States, Vladimir Putin, Wind power, wind turbines, windmill cancer. Bookmark the permalink. I was going to critical just from the title of this particular article, but after reading down the list, I changed my mind. Then you better not read my next post so that I don’t accidentally convince you to quit using electricity or food. We should surround Washington, D.C. with the things and let the blowhards provide our electricity. At least they would be useful for something. I used to drive by a large farm quite often… have you ever done that? When the wind blows the stench is indescribable. And maybe build a wall around them? We’ll only need 50 miles or so, much less than 2000 miles on the border. 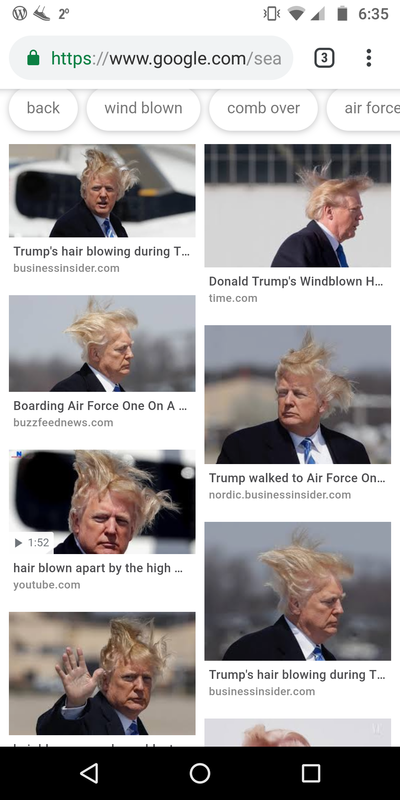 Wind has also been known to humanize presidential combovers, worse than any assault by Jimmy Fallon. Sun power might not be such a good thing, either. Staring at the sun seems to cause dementia. And it works in other direction, too. Thank you for the reblog! Though I have to add, there may be plenty of idiocy, but when it comes to Donald Trump, there’s very little truth in it. Now I understand why politicians produce so much hot air…to replace the hot air escaping from the Earth. Service before self! And now I understand why we have global warming: because politicians produce more hot air than is able to escape. Windmills came from Dutchland which is a member of NATO and owes us money. Need I say more? The worst part is that this Dutchland is socialist. This is what we need right now. And you can have it right here absolutely free! Painfully close to the way he likely sees the world. Though his view of the world sometimes changes as quickly as well, the wind. Just because there are zero documented cases does not make it untrue. God! Don’t be such a cynic! When I first heard of wind power I thought they were referring to flatulence. And I was sure that flatulence is more of natural gas industry. I had a wind farm once. Couldn’t grow a single damn wind. I guess you blew it as a wind farmer. i caught cancer from a windmill once. Then I stood in acid rain, swallowed some of it, and it burned the windmill cancer right out of me. This is probably why Trump’s Environmental Protection Agency is working hard to make sure we always have plenty of acid rain. Sooo…. number 7 made me spit my wine. But number 6 is my favourite, because I don’t really understand it, but I think I maybe do, and I suspect that as a result of your nebulous but humorous sentiments that God will likely strike you down, revealing you for the automaton that you are, X. I also want to inform you that occasionally, I produce wind, and I haven’t heard anyone complaining about that. I mean, they would tell me if it was a bad thing, right? I don’t know how many homes I could power via my own resources, but I’m willing to help out where I can. And in conclusion, I’d like to ask you to throw your support behind that Mark Paxson guy as his Vice-Presidential candidate in the next US election. I would vote the hell out of that voting booth for you two, I don’t care how much of a mess I make in here. Anyway, you can find Mark here: https://kingmidgetramblings.wordpress.com. Let the campaigning begin! X – I did not realize how much I missed your humor until I jumped back in to start reading and writing and landed right here. This made me spit out my coffee. Good job.